The Fairness Doctrine, a Federal Communications Commission law, requires that anyone who licenses broadcast time provide equal airtime to the opposing point of view on any issue of public importance. First enforced in 1949, it was repealed in 1987 under the Reagan Administration. Certain Democratic Senators, such as Nancy Pelosi and Jeff Bingaman, have recently voiced interest in having certain principles of the Fairness Doctrine enforced again. Conservative and Christian talk show hosts especially, but not exclusively, view this as an attempt to silence freedom of speech and as a violation of the First Amendment, fearing that it will also trigger the end of controversial talk radio. 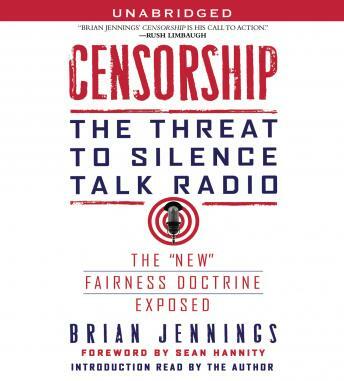 Exploring the ramifications of the impact of this powerful doctrine, as well as the “back door” tactics the new administration may use to achieve the same effects, Jennings’s Censorship provides fascinating insight and an in-depth history and context for what is certain to be a new battleground in today’s political culture wars.